This eve is not fair. It’s hot and humid with a storm on the way promising relief. Tonight is Fair Eve, the night before baking entries are due at the Spokane County Fair. Judging takes place on September 5th & 6th. Oh yes, it’s ba-king night, and the fee-ling’s right. Oh yes, it’s baking night, oh what a night. Oh what a night! I hope you sang along to the classic disco tune Ladies Night, if not read it again. I have no time to blog, let alone sit down, and shouldn’t be posting this blog right now but, I’m a giver, you want to read, so who am I to stop you? I can’t tell you what I’m submitting to the fair just yet. Photos and full details will follow in tomorrow’s post. I will tell you that I’m submitting six entries. Two are entries in the Fleischmann’s Yeast Best Baking Contest, first category is baked goods and the second category is dessert pizza. Each category has a $125 first prize and momma needs a new pair of shoes. A quick bread, cookies and two pies is all that I’ll tell you about my other entries for now. I’m in it to win it, but I really just love the motivation to bake. I’m really anxious to see the competition too. What does Spokane County have to offer? We’ll just have to see. I have seen some great fair photos across the country from The Fabulous Beekman Boys from Sharon Springs NY (Josh Kilmer-Purcell and Brent Ridge), known December winners of CBS’s “Amazing Race,” were grand marshals for the Grand Sunshine Fair Parade in Schoharie County. www.beekman1802.com I follow them on Facebook and find them funny and practical and awesome, you might too. 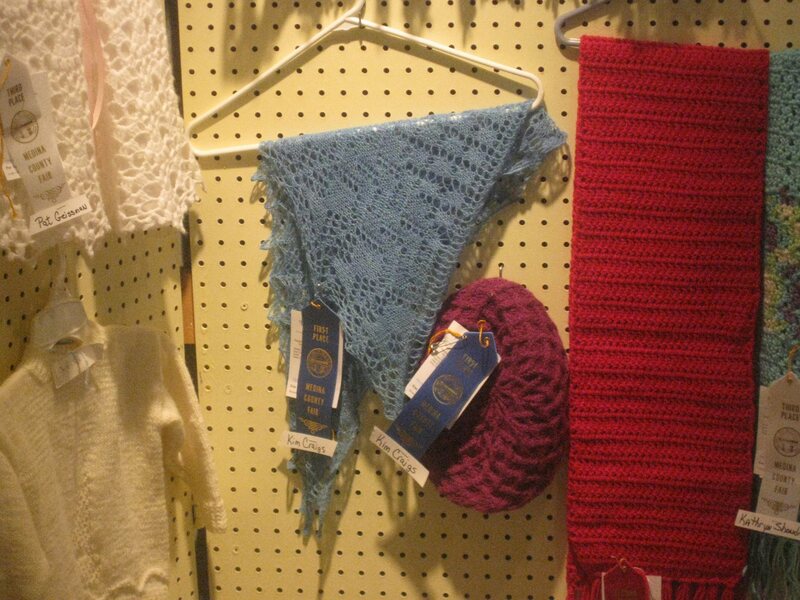 My cousin is a ridiculously talented knitter and took first place for each of her entries, a shawl and tam at the Medina County Fair in Northeast Ohio. She also took second place for a quart of cherries she canned. I just want to say that we had the same knitting teacher, our Grandma, yet I own “The Idiot’s Guide to Knitting” and she is a professional knitter, providing samples for knitting magazines to show in books and patterns. Blood is one thing, talent is another. I hope she doesn’t mind me bragging her up and showing off her blue ribbons. My friend’s kids are true 4-H animal raising fair winning professionals. Her teenage high school daughter took the Grand Champion prize for her steer (Go Taya!) at the Coconino County Fair in Flagstaff, AZ. Her husband also proudly won the Hogs in Heels Race – envision this guy – 6’3, skinny as a rail, in jeans and heels chasing a full size pig around a corral with a bunch of other men in heels. If my friend and her husband didn’t have 5 kids, I’d question his real motivation other than good old-fashioned fair fun. The kids also showed chickens, pigs, goats and steer and have a bunch of really cool giant belt buckles from past year victories to prove they are serious contenders. One of my co-workers worked at the Orange County Fair in Southern California for three weekends pouring wine samples from the various wines submitted for judging. He likes to think of himself as a Carney, but he is just one of the important people who make county fairs fun, even if it is the OC Fair which is a county fair on steroids. Now it’s my turn. I wasn’t going to blog but just churned out 575 words and counting just reliving the summer fun my connections have had at their county fairs. I hope you found some summer fun at your county fair. Wish I was a judge!